The Indian team lost the last two ODI’s in the ongoing CB series. The Indian batting has failed to fire in this series and has never looked convincing. The batting is lacking experiance in the middle order and the constant failures of Sachin, Sehwag and Yuvraj is causing Dhoni lots of headaches on the eve of their crucial match against the Lankans. The Indian bowling has been fantastic throughout the series and has been let down by some irresponsible batting. The game against the Australians should have been won by the Indians, if only there was someone who displayed a mature head as Clarke did for the Aussies. Dhoni has been the only batsman in this series who has shown the will to stick it out in the middle and play according to the situation. The rest of the batting has struggled to handle anu sort of pressure. Sachin has been throwing his wicket away after getting starts in almost all the matches. Being the most senior member in the squad, I guess he needs to be more responsible and guide the youngsters in the team. India is missing the solidity of Rahul Dravid in the middle order. 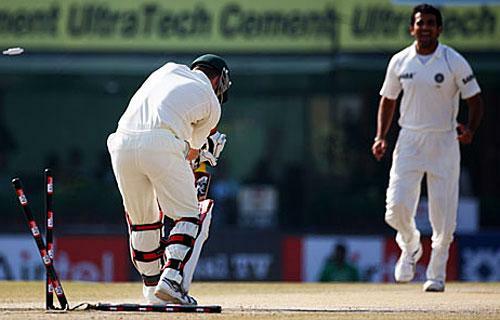 India also needs to stop experimenting with Irfan Pathan at number 3 as Robin Uthappa is getting wasted at number 7. He is an attacking player and needs to be playing in the top order. Irfan can be more effective at number 6 or 7 rather than in the top 3. Once in a while Pathan can be used at number 3 to surprise the opponents but not everytime. On the positive side the Indian bowling led by Ishant Sharma has performed brilliantly. They had set up the game against Australia, only to be squandered by the batsmen. I wouldnt say that it was a easy target but was definitely gettable. India now face the tough task of winning two of the next 3 games and their next game against the lankans being the most important. India winning this game would put lots of pressure on the Lankans as they would remain in the third spot in the table. The Indian batsmen need to fire and make a big enough score to give the team an opportunity to put pressure on the Lankans. Well this game is sort of Do or Die scenario for the Indians and hope that they rise up to the occasion.